The vernissage for Michelangelo Pistoletto's 'Da Uno a Molti' (From One to Many) exhibition at Maxxi, the city's new contemporary art museum, proved the ideal setting for Rome's art crowd to see and be seen. Indeed, it was something of a narcissist's paradise. Guests at the opening party last month were issued themed brooches made of mirror glass cut into geometrical shapes, allowing the partygoers to check the state of their maquillage and coiffeur by glancing discreetly down at the lapels of their interlocutors. And on entering the first section of the show - a hall of mirrors of more than 50 of the artist's trademark 'Quadri specchianti,' or Mirror Pictures, from the 1960s and '70s - the throngs found themselves repeatedly running into their own reflections in the polished steel surfaces of Pistoletto's paintings. Rome has around 70 museums, but until recently the city has had no significant public contemporary art gallery. Now it has two: the snappily acronymed institutions Macro (Museo d'Arte Contemporanea Roma) and Maxxi (Museo Nazionale delle Arti del XXI Secolo). The former was designed by Odile Decq, the latter by Zaha Hadid. Macro is in the classic Roman neighborhood of Salario, with its orange-tree-lined streets, covered food market, small local stores and trattorias. The museum's nucleus, first opened in 1999, was the former Peroni brewery. The building's size was more than doubled by the Decq extension, which was officially inaugurated in December. The new wing, although stylistically boldly contemporary, blends in with its ambience, offering wide and varied vistas of the surrounding neighborhood through its plate-glass windows and from its impressive landscaped staircases, ramps and roof terraces. Large areas of the museum are open to the public, including the terraces. 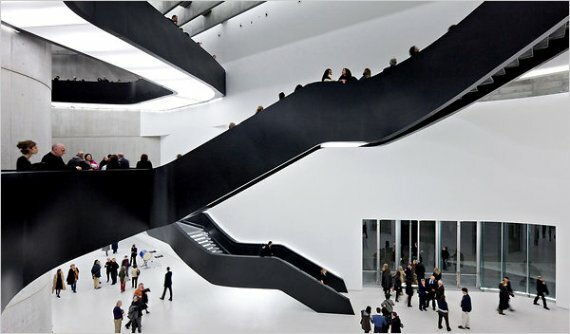 Maxxi opened its doors last May. It is further from the middle of town, near the stadiums and village built for the 1960 Olympics,and another new cultural center, Renzo Piano's Auditorium. Maxxi inhabits a more thinly populated district than Salario, and, while incorporating some former military barracks, it is architecturally more inward-looking, even self-absorbed, and remote from its surroundings than Macro. Both museums are in the process of building up their own permanent collections through long-term loans, gifts and purchases. Maxxi has larger single spaces than Macro and has so far staged fewer and bigger shows (the current Pistoletto exhibition features more than 100 works). Macro has gone for smaller, more numerous events - 40 of them in the museum's combined spaces since 2009. But while well-financed public projects have taken over and renovated old industrial sites, the city's contemporary artists have often had a more difficult time finding suitable accommodation. 'Former factories and warehouses offering studio space at reasonable rents are few and far between in Rome,' said the artist Marco Tirelli, at his atelier in the Pastificio Cererea, a former pasta factory, built in 1902, in the San Lorenzo district close to Termini, the city's main station. He has had a studio there since the early 1980s. This unusual haven has 60 studios providing work and living space not only for artists but also photographers, writers, musicians and actors. Guided through the labyrinthine multistory structure with its cobbled courtyards spanned by bridges, freight lifts and spiral staircases by the artist-photographer Ileana Florescu, who has had a studio here since 2001, I managed to find to Giuseppe Gallo, Marco Tirelli, Maurizio Savini, Pietro Ruffo and the photographer and chronicler of the building, Ottavio Celestino, all hard at work on pieces for forthcoming exhibitions and other projects. The sculptor Nunzio along with Mr. Gallo and Bruno Ceccobelli, both painters and sculptors, and Gianni Dessì, Piero Pizzi Cannella and Mr. Tirelli, who are painters, became known in the mid 1980s as the 'San Lorenzo Group.' This loose artistic alliance has since been joined by younger artists, among them Ms. Florescu, Mr. Ruffo and Mr. Savini. The Pastificio also has an attractive upstairs private gallery, Pino Casagrande's Studio d'Arte Contemporanea (7/A Via Ausoni). An additional space for temporary exhibitions was added in one of the courtyards in 2004 by the Fondazione Pastificio Cerere, presided over by a young member of the family that owns the buildings, Flavio Misciattelli. In 2009 the complex gained another exhibition space with the inauguration of the arty, bistro-style Ristorante Pastificio San Lorenzo, which occupies a former typographer's workshop on the ground floor of the building and also hosts temporary shows. The opening of Maxxi and the expansion of Macro not only stimulated the opening of new commercial galleries, but also has enticed foreign gallerists to set up shop. The first was Lorcan O'Neill (1E Via Orti d'Alibert), who moved his entire operation here seven years ago from London. When I paid a visit to his gallery in a former auto mechanic's workshop in Trastevere, newly arrived works included pieces by Anselm Kiefer, Gary Hume and Mr. Ruffo. Although slightly off the beaten track, part of the attraction of this area, according to Laurita Parrilla, the gallery manager, was that there were already three small contemporary art galleries in the neighboring streets: Studio Stefania Miscetti(14 Via delle Mantellate), Extraspazio and Volume (16 and 86 Via San Francesco di Sales respectively). Early in 2008, Larry Gagosian joined the party, opening a Gagosian Gallery (16 Via Francesco Crispi), round the corner from the Trevi Fountain. The gallery's grandiose, marble-pillared Corinthian façade is that of a former bank, an appropriate front for a dealer with imperial ambitions. Recent shows have included one by Gregory Crewdson of atmospheric, melancholy black and white studies of the empty lots of the Cinecittà in Rome. Once a rather quiet, low-key quarter, Rome's Ghetto district has become increasingly lively over the last few years. Valentina Bonomo opened her eponymous vaulted gallery in a charming courtyard (13 Via Del Portico d'Ottavia) in 2002. (Her sister Alessandra Bonomo has her own gallery space nearby at 62 Via del Gesù). Last April, Valentina Bonomo founded an association, Artughet, with three other contemporary art galleries in the Ghetto, all of which have picturesque settings: Ermanno Tedeschi Gallery (7 Via Del Portico d'Ottavia), Pio Monti (18 Piazza Mattei) and Edieuropa (56 Piazza Cenci). The association's first joint initiatives were held to coincide with the opening of Maxxi last spring. And to celebrate the Artughet's first birthday on May 7, the galleries' artists will be designing colorful contemporary cakes.